Discover the best of Canada coast to coast by rail on this epic journey! 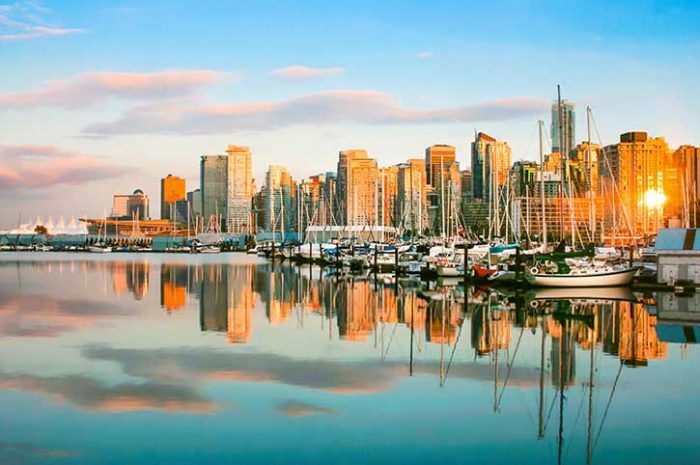 Start by enjoying two days in the vibrant city of Vancouver, also known as the “Hollywood of the North.” Then begin your journey east on a scenic train ride through the Canadian Rockies and Canada’s beautiful plains to Halifax on the Atlantic Coast. 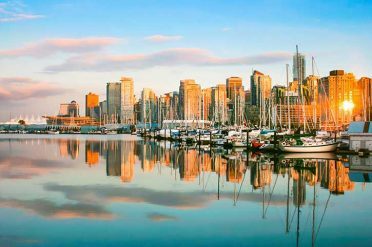 Consistently ranked as one of the world’s most livable cities, Vancouver is an ethnically diverse metropolis, filled with world-famous museums, cuisine and shopping. Check in at your hotel for a two-night stay and start to explore the city with your multi-day hop-on, hop-off sightseeing tour. Enjoy such popular sights as Stanley Park, the Vancouver lookout, the Vancouver aquarium and the vibrant downtown Vancouver area. Continue to enjoy Vancouver’s amazing sights today. Discover the peninsula known as Granville Island, a popular shopping district, or stop by Chinatown for some Asian cuisine. Visit the historic Gastown to take in the city’s past and quaint charm, and enjoy a special meal in one of the many fine dining establishments in the area. Board The Canadian today and make your way toward Jasper, witnessing more unprecedented views of the Canadian Rockies from the comfort of your seat. Enjoy panoramic views of crystal clear mountain lakes, majestic peaks, and ancient glaciers – all part of your rail adventure through the mountains! Arrive in the picturesque mountain community of Jasper today and make your way to your hotel for a two-night stay. 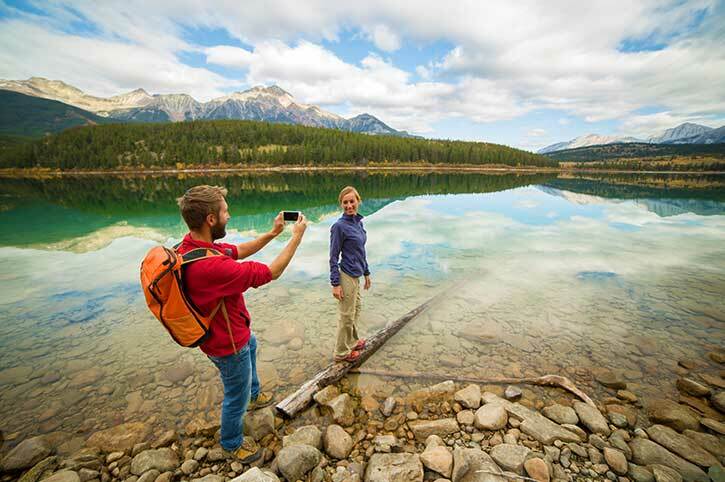 Enjoy the clear mountain air and beautiful surroundings of the Canadian Rockies. Get ready to experience some of the most breathtaking points in Jasper National Park on your guided sightseeing tour today. Travel in comfort as you learn the history, culture, and unparalleled beauty of the most rugged peaks in the Canadian Rockies. 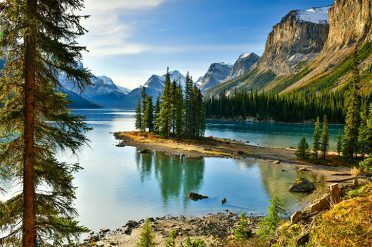 Included in the tour are iconic vistas such as Maligne Canyon (with its disappearing lake), Medicine Lake, and the Athabasca Lookout. Today you will start an unforgettable three-day journey through the heart of the Canadian countryside, passing a variety of beautiful landscapes including sparkling lakes, pine covered hills and open plains. Have your camera at the ready as there is a good chance you’ll catch a glance of a bear, elk, deer, or other wildlife that roam the countryside. Your journey is an unforgettable ride through the heart of the Canadian countryside! Arrive early in Toronto this morning and once settled in at your hotel, spend the day discovering the city at your leisure, perhaps visiting the iconic CN Tower, spending some time at the Eaton Centre, with over 250 shops, or just strolling the stunning waterfront. Use your hop-on, hop-off sightseeing tour to take in interesting landmarks and neighborhoods, with your guide pointing out important attractions and points of interest. 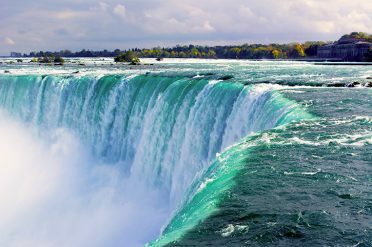 Experience one of the world’s most magnificent natural wonders on your full day adventure to Niagara Falls today. Drive through the picturesque countryside of the Niagara region with a scenic tour through the historic town of Niagara-on-the-Lake. 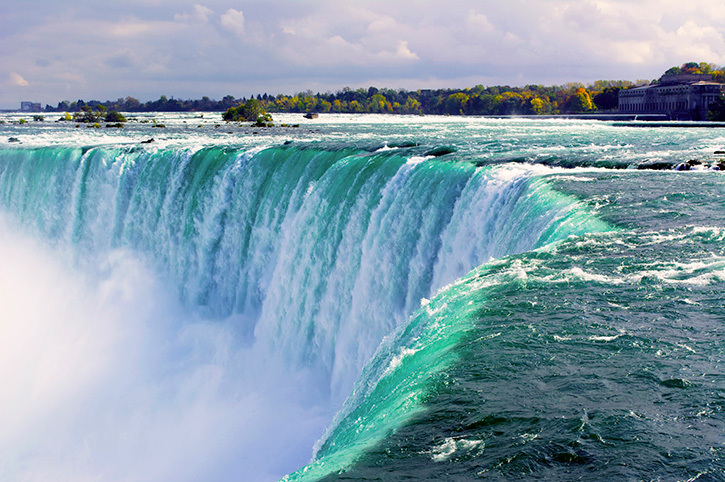 Once at the falls, enjoy an exhilarating up close and personal boat ride to the base of Horseshoe Falls. Today you will take the train from Toronto to the French-Canadian, European influenced city of Montreal. Enjoy a comfortable and scenic ride on your rail journey, with pleasant farm and woodland views out your window. 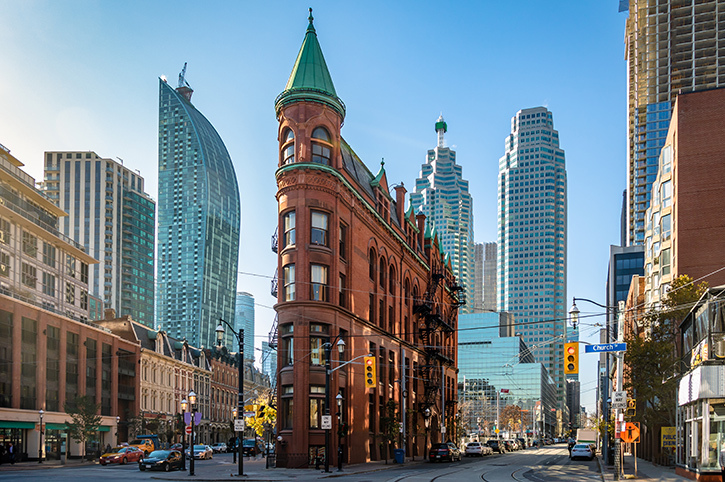 Once in Montreal, check in at your hotel and begin exploring the city at your leisure. Welcome to the “City of a Hundred Steeples!” Your included guided sightseeing tour today will provide an excellent experience of the city, taking you to such hot spots as Olympic Stadium, Montreal Harbour, historic Hotel de Ville, Mary Queen of the World Cathedral, Golden Square Mile and many more! Also, enjoy spending some time exploring this amazing city on your own. 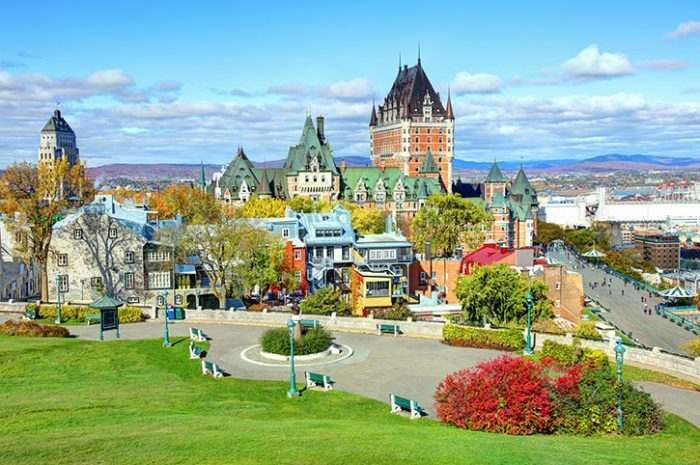 Arrive early to Quebec City today and enjoy a full day exploring this fascinating destination steeped in 400 years of history. The French-speaking capital city presents an intoxicating blend of old-world charm, modern elegance and cutting-edge chic. Explore ramparts, castles and intriguing museums. Step back in time in Place Royale and Old Port, and browse trendy shops and colourful art galleries. Dinner tonight is included at a classic Quebecoise restaurant. Today you will be picked up from your hotel and your local tour guide will take you to all of Quebec’s top attractions. You will visit such landmarks as the Plains of Abraham, the Basilica, the National Assembly, and the Place Royale. Immerse yourself in Quebec’s wonderful history as your guide lavishes you with fascinating stories. Spend some more time discovering Quebec City today before making your way to the VIA Rail station for your journey to Halifax. This scenic route features dramatic coastline views and pastoral inland valley scenes. The journey is frequently enhanced by the accompaniment of onboard presentations that give passengers the chance to learn more about local culture and the history of the area. Welcome to Halifax! Make your way to your hotel and check in for an overnight stay. 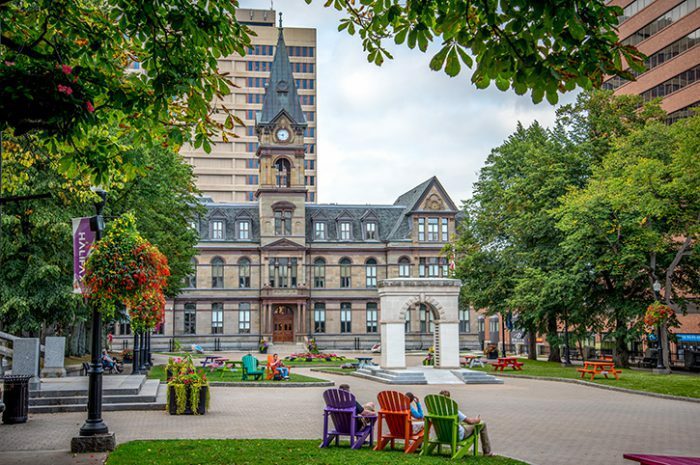 Enjoy the culture and history of this seaside town, perhaps strolling along the waterfront boardwalk and enjoying a meal of fresh seafood by the water before settling in to your hotel for the night. The adventure ends in Halifax. Choose to add extra nights here to explore the city further, move on to your next destination or head to the airport for your international flight home.